Where can you hear hip-hop, classical violin and spoken word, by artists from Venezuela, Pakistan and Hong Kong by way of Brooklyn? The answer: Jackson Heights (Queens) at the 5th. Chili Salon. 22 people braved a surprise October monsoon to crowd into the living room of Anthony Ng and Donna Chin. Awaiting them was a pot of seasoned chili - traditional and veggie – courtesy of Donna Chin; spicy dal and roti from Roy; Selroti from Nepal (courtesy of Luna) and as always, wine and plenty of lively conversation. The clear culinary winner was the humble corn-bread – prepared from a recipe of the Restaurant Opportunities Center of New York (ROC-NY). Sarah Husain began the evening with vivid poetry about faith, resilience, and the therapeutic power of writing. 'She desires instantaneously to move onto another road. Far from here, away from such rains and lightning.....' she immersed the rapt audience with imagery of violence, bruised souls and lives lived between disconnected signals. With the gentle tugging of her daughter by her side, Sarah left us with the poem, 'Evacuating 3 million people, or in other worlds having technical difficulties' and the question, can she sew memories, her desires digitally? In response to a question, Sarah chatted with the audience about the moment she considered herself a poet. She concluded by sharing how her work is moving into more performance and interdisciplinary realms. Next up was the talented violinist Gabriela Rengel, whose magical fingers danced across the strings as she rendered the 1st. Movement of Sergei Prokofiev's, Sonata for Solo Violin in D Major, Op. 115. 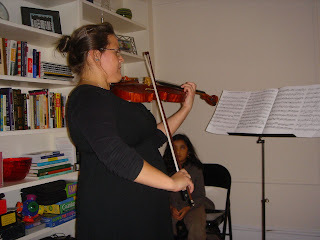 Written to be played by several violins, she told us that this piece is often played as a violin solo. Moved by Gabby's technical prowess, Shajan raised the sheet music from her music stand, and inspired awe from everyone about the dense number of notes that her piece contained. She talked about her intense 8-hour rehearsals, and how yoga and breathing exercises help her prepare and build endurance for her performances. When asked if she looked down on music that was digitally composed, she admitted bashfully, that she does admire Britney Spears and appreciates that the trained and classically untrained both have something to offer to the music world. Finally, it was the turn of the Hong Kong born, and Brooklyn raised Anthony Ng. Everyone jammed into his DJ room, replete with a priceless collection of nearly 1000 LP's. With a disarming smile, Anthony walked us through the basics of being a DJ, and performed a beat juggling set with A Tribe Called Quest's "Oh My God." Beat juggling involves playing two copies of the same record while going back and forth from each one and backspinning the records to create a new musical pattern. Anthony Ng (DJ Ang) was born in Hong Kong and grew up in Brooklyn. Since the early 80s at age 11, he has been a hip-hop fan. He credits hip-hop music and culture for shaping his early influences about community, progressive politics, and the power of music. Anthony first dee-jayed parties in college. He further developed his craft after graduating, when he made the biggest purchase of his life at the time – buying a pair of Technics 1200 turntables. Both his love for spinning, and its ability to bring people together has resonated with Anthony throughout his life. 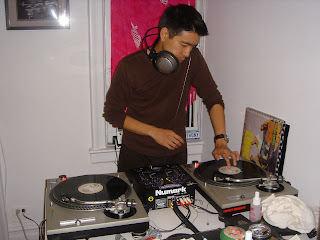 In 2002, he and several friends formed Restless Produxns, a group that hosted the popular Tantrum and Sweet Sessions parties that offered a space for queer folks of color and their allies to connect and get their dance on. While he doesn’t do as many parties as he used to, you can still find him getting on the 1s and 2s in his new pad in Jackson Heights. Do memories change over time? And does our pining to relive those moments, somehow alter our recollection? This was the undercurrent of Chili Salon #4. Pepper jack cheese, spicy tofu, Kerala fish curry and chili guacamole decorated the table, topped by cinnamon brownies and ghee-infused jelabis. Surprise guests from Brooklyn peppered the conversation, with Queens locals holding down the fort. Afzal Hossein's paintings recollected hazy memories of his childhood, from the vicarious angst of a new bride to stealing mangoes from a neighbors tree. A native of Bangladesh, Afzal led us down memory lane, with a slide presentation of the land he left in 1996, the new world he now inhabits, and the immigrant experience that continues to provide inspiration. We were transported, as he spoke about the chickens that ran wild outdoors and on to the frying pan, and excursions to country fairs where distant monuments came alive for a few coins in a Bengali Viewfinder. When asked how life in America had changed his memories of Bangladesh, he responded that he considers himself to be an American, (though Jackson Heights is not really America), and that distance makes the heart grow fonder. Next up, we were transported to 1957 Kerala, India, in an era where steamy conversations on the backwaters, reading Marx in paddy fields, and free education for girls, left a population talking, mobilizing, and readying itself for change, long before Obama and the Internet. This provides the backdrop for short story writer and essayist Meera Nair's new book Harvest. Set during the revolutionary Kerala Peoples Science Movement, where science provided an activist precedent against caste politics. Through the eyes of Saro, we are taken into the life of a young girl, witnessing the change around her, feeling guilty for always feeling hungry, and contemplating whether she should find work to relieve her burdened mother. Meera vowed that it's not a political work and she veers away from writing or story lines that are pedantic. After seven years of writing, dreaming, imagining, and putting pen to page, Meera said she came to regard the characters, as family. With editing in full swing, the novel should be out in bookstores soon. We hear from Jackson Heights local and acclaimed short story writer and essayist, Meera Nair, who writes of worlds intimate, painful and anything but masala. Meera Nair has an MFA in Creative Writing from NYU. Her debut collection Video (Pantheon 2002) won the Asian-American Literary Award. Her work has also appeared in the New York Times magazine, the National Post , The Threepenny Review, Calyx, Discover and on NPR's Selected Shorts. Meera has won fiction fellowships from the New York Foundation for the Arts (2004 & 2008) and the MacDowell Artists’ Colony. Her novel “Harvest” will be published by Pantheon. A native of Bangladesh, Afzal Hossain takes us through a visual image down memory lane, with a slide presentation of the land he left, the new world he now inhabits, and the immigrant experience that continues to provide inspiration. Hossain received his B. Arch. from Pratt Institute. He studied painting at the New York Art Students League. He worked for Robert A. M. Stern Architects as a designer and later founded BANG Architecture/Design with his wife Julie Nymann. He currently resides in Jackson Heights. It began on a muggy July evening at 8pm - the type of night where you wipe your forehead a couple times, only to realize its better to feel the sweat nestle on your bare skin. We could have been in Nepal or Gambia or the Phillipines. But we were in Jackson Heights in the County of Queens, inspired by the rhythmic storytelling of ancestors. Representing the People's Republic of Brooklyn was Santosh and the 'Jali' (bard) Salieu was here from the Bronx. To spice the already 'hot' affair, we munched on Mapu Tofu (Donna Chin), Chili Eggplant (Roy Sirengo) and a Chili-Avocad0 salad (Luna Ranjit.) For show or for taste, raw chili peppers in lemon juice decorated the table, for the adventurous few. 'I was raised cradled in the unsteady arms of men sweet with gin' sang the spoken word artist Dorian Merina, from his selection of poems, Stone of the Fish. Inspired by a visit to the Philippines, the poem brought to life the struggles, hopes and dreams told through the eyes of a child. This followed by "Omission Declaration", based on Thomas Jefferson's word, omitted in the final draft of the Declaration, and a third poem called 'Rebirth' inspired by confirmation hearings for judge Sonia Sotomayor. Devouring Dorian's last words, we were 'lasing na siya', drunk until morning. Kewulay Kamara and Salieu Suso, transported everyone to West Africa with the lilting echoes of fisherman, unrequited love, and longing. Passed down by generations of storytellers before them, Kewulay and Salieu wove a tale around a beautiful woman, a poor fisherman, and a wealthy merchant-suitor called Massana Cisse. Massana Cisse invokes the help of a medicine man who warns that if he were to acquire the affections of this woman, it would come at a great price. Drunk with desire, Massana Cisse concedes and the wedding is arranged. The bride - sad from being separated from her true love - comes near death and as predicted by the medicine man, Massana Cisse dies. The salon rounded up with more chili, laughter, and a go-around, where everyone admitted to being a closet artist, whose craft at dance, DJ'ing, writing, spoken word had fallen prey to 9-5 routines and inner critics. It also invoked inspiration - that we all are artists - and sometimes just need a little push, a supportive community, and a living room stage. In the words of Kewulay, "You don't have to go to the (East) Village!" Things are happening in the village of Jackson Heights. Stay tuned for more musings and step up to the mic - all are welcome. Dorian Merina is a poet and journalist. He has reported for The Miami Herald Newspaper, the Philippine Center for Investigative Journalism, The New York Times, The Jakarta Post, among other media sources. He is one of the producers of Asia Pacific Forum, the weekly radio show on WBAI 99.5 FM in New York. He is the author of two chapbooks of poetry, The Changegiver and Stone of the Fish, and a spoken word CD, Heaven is a Second Language. He’s worked as a teacher and a counselor in the public schools of Los Angeles. Kewulay Kamara is a poet/story teller from Sierra Leone, West Africa. Mr. Kamara performs to music inspired by his traditional roots in Madenka oral traditions. His writings have appeared in journals and periodicals such as Black Scholar, Rhythm Magazine, and Teacher and Writers as well as being featured in the New York Times, CNN and other major media outlets. He is a recipient of grants from National Geographic’ Genographic Project, the AEV Foundation, Ford Foundation and New York State Council on the Arts (NYSCA). Mr. Kamara is a lecturer at John Jay College of Criminal Justice, and founder and director of Badenya, an Africa arts presenting organization in New York City.